The first time I made it, I called it “Cheater’s Cherries Jubilee.” For a few nights more in a row than I’ll admit on the internet, I pitted ~2 dozen cherries into a small bowl, dropped a piece of orange peel in, and popped it in the microwave for 90 seconds. I scooped the still-warm, slightly-tart cherry sauce over a bowl of vanilla ice cream and borderline inappropriately oooh’ed and aaah’ed my way through dessert. 90 seconds. That’s all it took for a quarter-pound of fresh cherries to cook into a borderline magical dessert sauce. No butter, no booze, and most importantly: I still have both of my eyebrows. 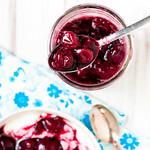 After a couple of nights of making single-serving cherry sauce in the microwave, I buckled down and pitted an entire pound of cherries for a larger, “yogurt topping” batch. 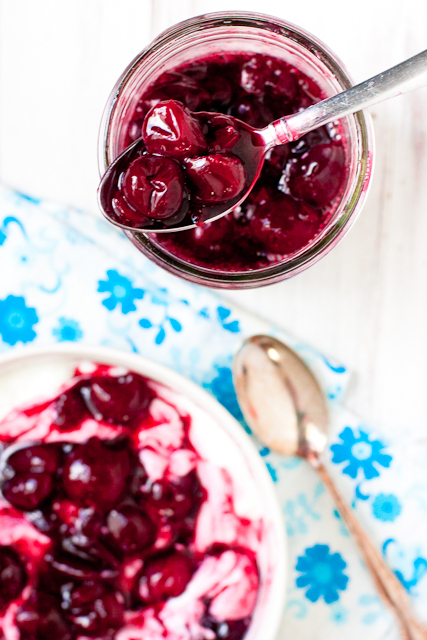 Making your own fresh cherry dessert topping couldn’t be easier. I mean, maybe it could… but I think you’ll be happier with a DIY version than opening up a jar. And it’s applications are endless: top pancakes and waffles, scoop over ice cream, swirl into your favorite brownie batter, serve over plain cheesecake, swirl into yogurt… I could keep going. But then I’d have to make another batch. Fresh cherries are turned into a decadent ice cream or yogurt topping in just 3 minutes in the microwave. 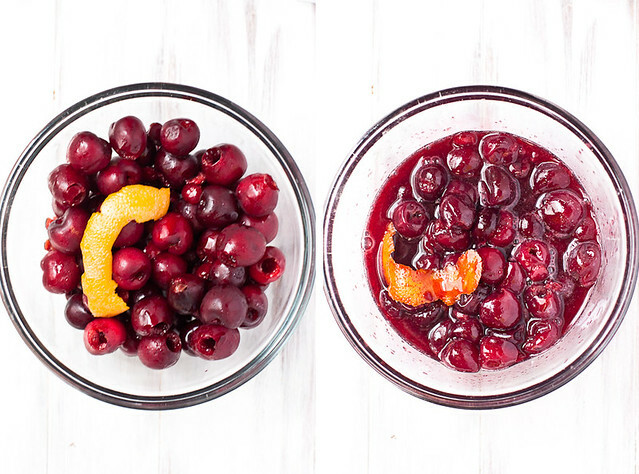 Place cherries and orange peel in a microwave-safe bowl and sprinkle cornstarch over top. Microwave on high for 90 seconds, stir, and heat for another 90 seconds - the mixture will bubble up so don't walk away! Or better, place a paper towel under the bowl. Add any sweetener, if desired, and let cool a bit. 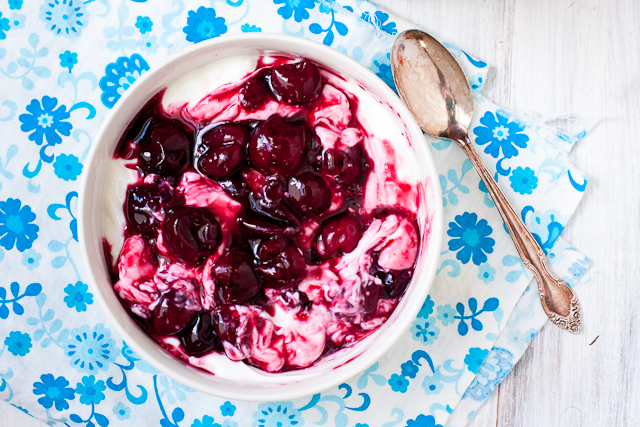 Scoop the still-warm sauce over ice cream for Cheater Cherries Jubilee or chill completely and swirl into yogurt. Will keep at least a week in a jar in the fridge. 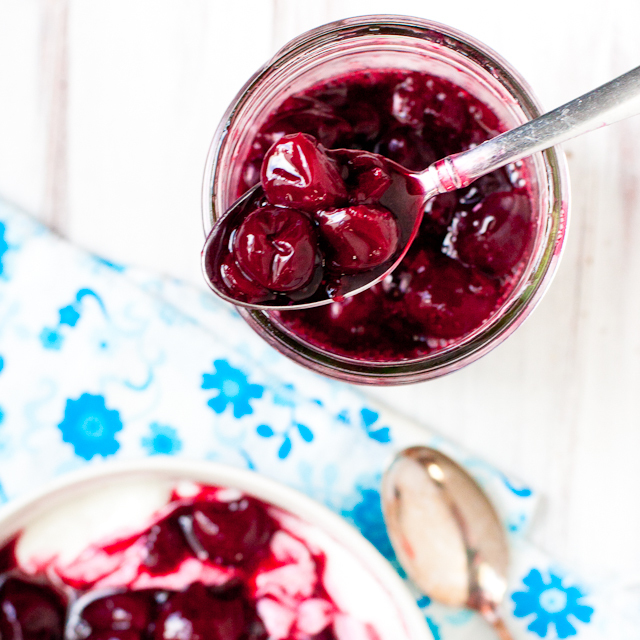 Ooh wow, I had no idea it could be so simple to make cherry sauce! Putting it in/on brownies sounds AMAZING!! This is ingenious, I would just eat the whole batch as is, no ice cream, brownie, or yogurt necessary!! This color!! Oh so pretty and delicious! Perfect timing for this delicious recipe! I just bought several pounds of cherries at Whole Foods One Day Sale yesterday! How many cherries do I have on my counter? SO MANY. And more than enough to make a few batches of this! YES. Made this Saturday night for my in-laws to spoon over some Bluebell Homemade Vanilla. Added a splash of bourbon, because duh. It was so crazy good! Thanks for sharing! !